I recently learned that NBC News’s Chuck Todd, whose is the host of Meet the Press, is publishing a book about President Obama’s presidency. The Stranger: Barack Obama in the White House seems interesting, and I’d like to read it. (I’ve been wanting to read a book on Obama’s presidency, but most of the ones published seem to be overly biased against him or in his favor. From the reviews I’ve read, Chuck Todd’s book seems pretty even-handed. The New York Times recently published a review of The Stranger. The review gives a good overview of the book. The underlying problems Mr. Todd diagnoses have already been pointed out by many reporters and politicians, especially in the run-up to the midterm elections. Those problems include what critics see as Mr. Obama’s passive leadership and lack of managerial experience; his disdain for, but inability to change, politics as usual in Washington; and his reluctance to reach out to Congress and members of both parties to engage in the sort of forceful horse trading (like Lyndon B. Johnson’s) and dogged retail politics (like Bill Clinton’s) that might have helped forge more legislative deals and build public consensus. I don’t think Obama’s domestic policies have amounted to much. How can one credit him with the economic recovery? What actions did he take––independent of the actions of the previous administration that he inherited––that helped the economy recover? I tire of the empty rhetoric that the Republicans look out for the rich people and the Democrats are looking out for the poor. What are the results of Obama’s presidency? (A portion of which, by the way, coincided with a Democratic-controlled Congress.) Greater income inequality. The number of billionaires have doubled. Some of the largest private campaign donations have been to Democratic candidates. And, according to the rising star of the Democratic Party, Elizabeth Warren, the new regulations on the big banks aren’t being enforced––setting us up for another round of “too big to fail” banks being rescued by the government. Obama had once promised a more transparent government, but his administration has lacked transparency just like former administrations. They actually might be less transparent. The recent Gruber comments underscore this lack of transparency during the push for Obamacare. As for the administration’s handling of the Arab Spring, Mr. Todd reports that Mr. Gates, Mrs. Clinton and Mr. Biden all believed — and were hoping — that Egypt’s longtime president, Hosni Mubarak, would survive the 2011 protests against him; they worried that without him the country could spiral “into the unknown.” But Mr. Obama, writes Mr. Todd, sided “with his younger staff” (including Mr. McDonough, Susan Rice, Samantha Power and Benjamin J. Rhodes) “over the more seasoned principals,” and told Mr. Mubarak that he needed to step down. Egypt would, in fact, begin to spiral downward: Last year, military officers removed the country’s first democratically elected president, Mohamed Morsi and suspended the constitution; its new leader, Abdel Fattah el-Sisi, has presided over a highly repressive regime, jailing political opponents and cracking down on dissidents (acts that in turn have threatened to radicalize civilians). Mr. Todd reports that a prominent, recently retired Democratic senator argues that the Obama White House made a “fundamental policy mistake” in “getting involved in Egypt, which led to Libya then Syria,” and sending mixed messages to the Middle East. I write my comments as a conservative who likes Obama. I’ve never found him sleazy. He seems to be a man of integrity and intelligence. I didn’t want him to fail. I remember reading an article by Andrew Sullivan before the 2012 elections. Sullivan made a strong case, in my opinion, that Obama’s second term would be one of the most successful presidential terms in the history of our country. Sullivan pointed to the many opportunities––domestic and foreign––that would face the President. He thought that the President had the ability to lead the nation effectively through the country. I was somewhat convinced, though my libertarian background (coupled with my pro-life position) was enough to make me wary of voting for Obama. But I didn’t mourn when he won. I neither voted for nor supported Romney. With his second-term halfway finished, I think Sullivan’s predictions were wrong. He was right about the number of opportunities that Obama would face. He was wrong about Obama being able to manage the crises and lead the nation through it. I do plan to read Todd’s book sometime this holiday season. Maybe the overall picture of Obama’s presidency is less depressing than the reviews of the book intimate. 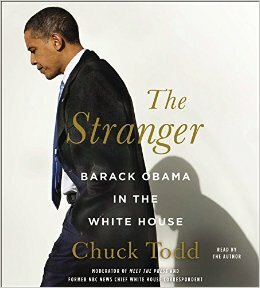 You can read the entire review of Todd’s The Stranger here: ”Anatomy of a Presidency While It’s Still Unfolding”.